It is the human tragedy of horrible accidents that gets our attention. We are a sensitive species and respond emotionally. It is why tabloids put bloody photos on their covers and why rubber-neckers on a highway often cause worse accidents than the one they are viewing. It is a natural instinct. In Meditations 17 , John Donne wrote: “Any man’s death diminishes me, because I am involved in mankind.” Death affects us. Nevertheless, the tragic train derailment in Quebec a little more than a week ago has consumed less press than one might have expected. Why? Perhaps because it happened in Canada, but more likely because it did not fit the narrative the Left has been telling about the risks of carrying crude through pipelines, not trains. A little after 1:00AM on Saturday, July 6, the center of the small Quebec town of Lac-Mégantic was destroyed. A train carrying 72 carloads of North Dakota shale oil went off the tracks in the center of the lakeside village. It was on its way to the Saint John Refinery in New Brunswick. The cause appears to have been human error. 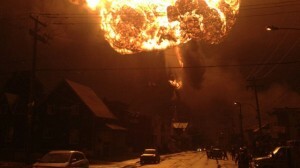 The train carrying the oil had stopped at its regular overnight stop, about six miles outside of the town. The location is on a slight, downward-sloping grade that leads to the village. Handbrakes had been set, and one of the five locomotives was left running to power the airbrakes. The locomotive caught fire, which was extinguished in about 45 minutes. But in doing so, the engine was switched off to avoid the fire spreading. That act caused the airbrakes to no longer function. In retrospect, it seems obvious that a second engine should have been turned on, so the airbrakes would work and that an engineer should have stayed at the sight. The handbrakes were incapable of holding the weight of the 72 cars filled with crude, and the train began to move on its own, gathering speed as it traveled toward the village. With no one at the controls, the train was moving too fast to handle a curve in the tracks in the middle of the village. It derailed. The ensuing explosions destroyed at least thirty buildings, including flattening the Musi-Café, which typically, according to news reports, would have had 50 or so patrons at that time. As of Friday at least fifty people were missing or dead. Oil independence has been a goal for both political parties since the oil crisis in 1973. Our Middle East foreign policy has been dictated for decades by our energy needs. However, recent technological developments in horizontal drilling and fracking have noticeably increased the supply and production of North American crude. A report earlier this year from Citigroup suggested that in five years we would no longer have to import oil from any country other than Canada, and that in a “matter of years” the U.S. could be an exporter, instead of one of the largest importers. Oil, though, once extracted, must be shipped to refiners. The cheapest and safest way to do so is through pipelines. In light of the devastating explosion in Quebec, the irony for environmentalists is that they have spent the past few years lobbying, not for safety of train transportation, but against the Keystone XL Pipeline, designed to bring crude from Canada and North Dakota to refineries on the Gulf of Mexico. Consequently, trains have been increasingly used to ship crude. Most of us give very little thought to how much we depend on energy in our daily lives and how much we expend to do so. From refrigeration to cooking, from driving a Prius to purchasing organic blueberries, from the clothes we wear to the books we read, energy is required. And no matter how much we may wish otherwise, oil, gas and coal will be the dominant fuels for the next several decades. Wind turbines require milling, which takes energy, and solar panels must be built in factories that consume electricity. Most environmentalists refuse to acknowledge that progress has been made over several decades. A hundred and twenty-five years ago, in the town in New Hampshire where I grew up, most of the land had been deforested. Wood had been used as a fuel and forests were stripped of their growth. In the second half of the 19 th Century, oil and coal began to replace wood; and the trees came back. When my wife was growing up in New York City, the common fuel for most apartments in Manhattan was coal. Soot in many parts of the City was a health hazard, but the desire to cook and be warm superseded the preference for cleaner air. Today, we not only keep warm in the winter, but cool in the summer, and the air we breathe is much cleaner thanks to oil and natural gas. When I got my driver’s license, the typical automobile got about ten miles to the gallon. Today, the average car gets 23 miles per gallon. With the recession, demand for oil in the U.S. has fallen, but the more important observation is that between 2004 and 2007, while the economy was growing robustly, oil consumption was flat. We have become more energy efficient for decades. Do we have further to go? Of course. There should be no stopping our pursuit for perfection. But one should not undervalue the strides that have been made. The battle between environmentalists and economic progress has been epic for decades and, in my opinion, has been a positive contributor to our well-being. Our economy has grown, our standard of living has improved, our surroundings are cleaner and life is more pleasant. But success relies on a balance between economic growth and conservationists. As a rich people, it becomes easy to forget the costs we incur when we save a Red-Eyed Tree Frog or some exotic plant. In recent years, the intensity of environmentalists has been fueled by politicians who see them as a bloc capable of influencing elections. President Obama, in 2008, played soloist to their chorus when he arrogantly promised that his election would mark the moment when “the rise in the oceans began to slow and our planet began to heal.” But the Left does not like to admit success (and give up an electoral issue), or acknowledge improvements. Recent pollution is almost completely associated with developing economies. When one is poor, starving and cold, the fate of the Red Tail Hawk is low on one’s list of priorities. If and when emerging nations become richer, environmental concerns will assume more prominence. It is the natural order of things. Economic growth has always been and always will be a trade-off between the physical comforts progress brings and the desire for a cleaner environment. While the accident in Lac-Mégantic – the worst in Canada in a hundred and fifty years – was tragic, we can never be accident free. We can simply make them as infrequent as possible, and that has been happening. Much has been written over the past few days as to how much more oil has been shipped by rail than five years ago. In 2008, 9,500 carloads of oil were shipped in the U.S. By 2012, that number surged to 233,811. Despite an increase of twenty-five times in rail shipments of U.S. crude, safeguards are better today than they were. There were eight spills in 2008. In 2012, there were sixty-nine – an increase of only 8.6 times. The reasons for the increase in rail shipments can be attributed first, to the happy fact that domestic (and Canadian) oil production has increased, reducing dependency on imported crude. Second, domestic oil production has increased faster than pipelines have been built. Delaying the Keystone XL Pipeline may not have led directly to the accident, but it didn’t help. It is unrealistic, to argue, as did Frances Beinecke (president of the National Resource Defense Council) in Friday’s USA Today that we must cut our oil consumption to a level where there is no need for oil from the Tar Sands or the Bakken Shale. Her claim is that if we don’t take it, no one else will. That is emphatically untrue. Without new sources, crude prices will rise, perhaps ruinously. Alternatives are not yet ready. Her argument ignores the effects of depriving people of gas for their cars. It disregards the economic effect of shuttering factories; she makes no allowance for more expensive food, or the consequences of higher prices for clothing and homes. She should think of the effects of higher energy costs on the developing world. Ms. Beinecke should take a deep breath, think of the world as it is – the turmoil in the Middle East and its fragility as a source. She must ponder the effect of rising energy costs on emerging economies and the importance of oil independence to the U.S. She should consider how far we have advanced environmentally over the past several decades and think of the delicate balance that has been achieved between growth and the environment. We are richer and cleaner than we were thirty and forty years ago. And we shouldn’t deprive the emerging world of a chance to become richer. Energy independence is critical to our future. We live in a globally competitive world. Our edge is technology, an entrepreneurial spirit and now abundant energy. Oil must be refined into products. That which is produced in the heartland must be shipped, either through pipelines or rail, to refineries, which are generally located on the coasts. Pipelines have proven to be safer and less expensive than rail, but preservationists have hindered their construction. That said we should be mindful, they are not without risk. But, then, nothing is. An environmental watchdog is critical in ensuring that corners are not cut by pipeline operators; nevertheless, we need them. As we mourn the horrible loss of life in Lac-Mégantic, we must consider the role energy plays in all we do. I doubt that even Ms. Beinecke or Mr. Obama want to return to a pre-industrial age. We need growth; we would like a clean environment. As a nation, we have benefitted for decades from the conflicts between economic growth and the civilizing effects of environmentalists, but progress is evolutionary – too slow for many on the Left, especially for those who see this as a campaign issue. As the rhetoric gets hotter we risk losing what has been a positive symbiotic relationship. We can do a better job of anticipating problems and be faster in responding. We can always improve, but patience, in this regard, is a virtue. We evolve in the way we live. We always have. Those on the Left who think of themselves as enlightened and “smart” should be careful for what they wish – they risk killing the goose that has allowed this nation to not only prosper, but to become healthier as well. This memorandum has been prepared as a matter of general information. The accuracy of the material submitted, though obtained from sources believed reliable, is not guaranteed by us and may not be complete. The opinions and estimates expressed in this memorandum accurately reflect the personal view(s) of the analyst(s) covering the subject securities on the original date the memorandum was issued, but are subject to change without notice. Analyst compensation at our firm is not directly related to any specific recommendation or views contained in this research. The analyst, officers and employees of this firm may at times have a position in the securities mentioned herein.